To find out if this is a true takeover, we turned to two of our home design-build pros, Gail Drury, CMKBD and Janice Teague, CKD CBD. Here’s their take. 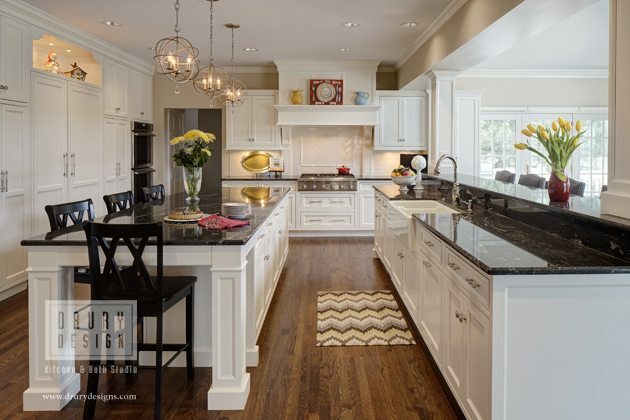 Q: Is choosing stained over white kitchen cabinets a new trend? Q: White kitchens have been in vogue for a while now. Why is that? Gail Drury: White has been the number one selling color for as long as I have been doing kitchens. But, the style of white cabinetry has changed over the years. Twenty years ago, the white cabinets were made of a five-piece maple design in a very traditional door style and painted. Then, it became popular to use a one-piece door shaped to look like a paneled door. They were made of a MDF material that had a design routed out of the slab to look like a traditional door. These were a more durable finish, but had limited design options. Then, the white paneled doors came back in style, but they were made of an inset construction. These were a lot more detailed and very traditional in style. We still do a lot of this construction today. The most popular white cabinets right now are a little more transitional in nature with wider frames and flat center panels. Janice Teague: White kitchens are pretty much like classics. They’ve always been around and they will always be around for people who like clean lines and pristine looks. Yet, an all-white kitchen can be very sterile. Because people want to warm things up a bit, the all-white kitchen trend is definitely winding down. You can add in a backsplash with more color or an island accent. I recently finished a project in Deer Park that used rich taupe and charcoal tones. Q: How is natural woodworking its way into recent Drury Design design-build home remodeling projects? 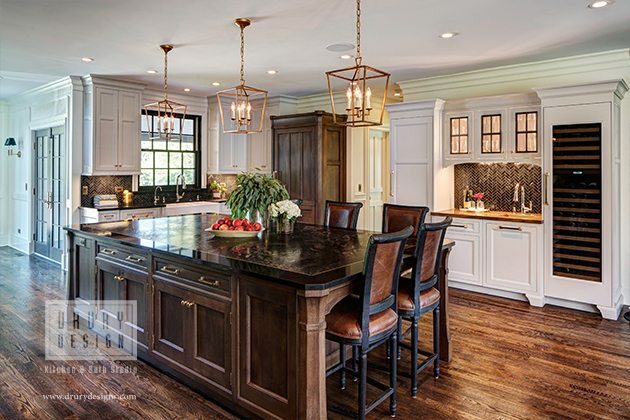 Gail Drury: Stained wood cabinetry is coming back in style. Now, it’s a more rustic looking wood but is definitely contemporary in nature. Slab style doors with no detail are becoming very popular. The darker wenge finishes of a couple years ago are being replaced with light finishes with a rustic edge to them. Simple doors with very detailed finishes add dimension and character. Janice Teague: Like fashion, kitchen design is cyclical. While stirrup pants and platforms shoes from the 60s and 70s are hot again, they’re back with a twist. So are stained wood cabinets. The first time around, in the 80s and 90s, stained wood cabinets were all about a smooth finish with details in the trim work. Today’s stained cabinets are simple styles with grainy finishes. While cherry is long gone, mahogany, white oak, and hickory are in. Each wood species is at a different price point. For example, hickory is less expensive than mahogany. And, if you’re going with a darker cabinet, you can conserve your budget with less trim and detail. Our job is to educate our clients so they can make the smartest investments in their kitchen project. That’s one of the biggest differentiators Drury Design has as a premier home design company. Our clients are looking for something they haven’t seen online everywhere. After so many years of neutrals, it’s exciting to see a return to color.